2002 – a band by Randy and Pamela Copus – have since their debut in 1992 been a favorite among New Age music fans. With this year’s release, Trail of Dreams, 2002 have proven yet again that they are among the best bands in the genre. Now 10 years old Sarah Copus has become a band member too, and 2002 is no longer “only” a duo. It is with pride we present 2002 as New Age Stars Radio’s Band of the Year 2014. Trail of Dreams is the name of 2002’s highly anticipated new album, which is being released today. It’s obvious that dreams really do come true, because 2002 have never been better. Listening to the new 2002 album is like reading a novel where each page is filled with mystery and magic. There’s so many details and layers. You just have to keep on reading, or in this case listening, to find out how it ends. It is a rare quality in music. I never hold it against an artist that he or she is inspired by Enya. Her sound is easy to imitate, but it is almost impossible to do well and create something new and inspired. 2002 is different, because they incorporate this sound and make into something unique and different. That said, fans of Enya will feel right at home. 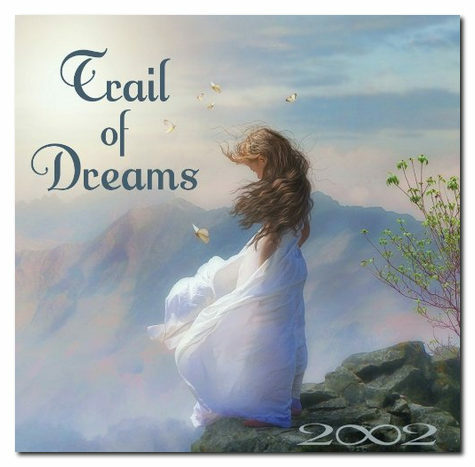 In short; Trail of Dreams is the kind of album many New Age music artists dream of recording. It’s filled with positive energy, yet still there’s a sense of mystery. With Trail of Dreams 2002 have delivered their best album to date.